Last month I was watching a program in the T.V where in a Doctor was advising people to include lots of radishes in their food as it helps in taking away the carbon deposits from our body which gets deposited because of the fumes from vehicles when we go out. Ever since this Arun started demanding that I make radish sambar daily as he inhales these fumes on the way to school and back. I also remember my grandfather insisting on including radishes and gourds more in our lunches during the summer season. These vegetables have more water content and help in keeping our tract clean. This Sunday I planned out an elaborate menu which had radish and beans sambar, tomato rasam, vazhakkai curry and vendakkai curry, curd, vadams, moor milagai. We all had a feast and enjoyed like anything. Scrap the skin of radish and cut them into thin round slices. Cut the French beans into long pieces. Pressure cook tur dal with turmeric powder, asafetida, few drops of oil and 2 cups of water along with radish and French beans. Mash the dal well. Soak the shallots in some water to remove the skin quickly and halve them. Chop the tomatoes. Soak the tamarind in some warm water and extract its pulp. In a kadai heat the oil and add mustard seeds, when it splutters add the cumin seeds, fenugreek seeds and the whole red chillies. Now add the shallots and sauté till they turn pink. Add the chopped tomatoes, curry leaves and fry till the tomatoes turn mushy. 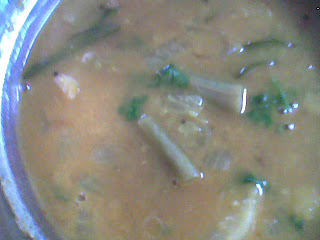 Now add the tamarind pulp, cooked radish and beans, sambar powder, salt and bring it to a boil. Now add the cooked dal and extra water if needed to adjust the consistency. Cook for 10 minutes and garnish with coriander leaves and serve with rice. Arun likes vendakkai so much that I have to cut this veggie only after send him to bed. Ever since he heard that he will become brainy if he eats more vendakkai he has started eating it raw and I am left out with only half the quantity before I could cook it. I know he drooled so much looking at Srivalli’s lunch series. So this recipe is from her blog. Wash the vendakkai well and spread it on a cloth to dry. There should be no moistness. Trim the head and tail of the vendakkai and cut them into round pieces of 1 inch thickness. In a kadai heat the oil and add mustard and urad dal. 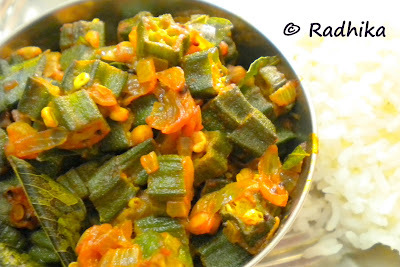 When the seed splutters add the vendakkai and stir well so that the okra gets fully coated with oil. Now add the red chilli powder, turmeric powder and coriander powder, salt and mix well. Don’t close the kadai with a lid and let it cook for at least 10 minutes till the okra turns crisp and well cooked. Add more oil at this stage if you really want it crisp. Garnish with coriander leaves and serve along with rice. I liked Nandita’s traditional lunch series very much and have book marked a few recipes to try in future but this recipe is the one I tried as I had to please Arjun, my younger son as he likes plantain very much. If I didn’t he will start complaining that I make recipes only what Arun likes most. So this particular recipe is from her series. Trim the top and bottom of the plantain. Peel the skin with a peeler. Halve the plantain length wise and cut them into 1 inch thick pieces. In a kadai heat the oil and add mustard seeds and urad dal. When the seeds splutter add the vazhakkai and sauté till it gets coated with oil. Now add the chilli powder, turmeric powder, salt and water and mix well. Close the kadai with a lid and cook till all the water gets absorbed and the plantain becomes soft and cooked. Both the vendakkai and plantain stir fry goes to Nupur’s Less is more.